"This is the story of the Port of Los Angeles an extraordinary monument to the power of human energy, vision and selflessness. Indeed, the history of its growth and development incorporates so many of the elements of high drama that it reads like the inspirational fiction of turn-of-the-century America. It is, in fact, a rich and pungent slice of authentic frontier Americana in its purest form..."
-Charles F. Queenan, From Wilderness to World Port, 1983. The first official documentation of the harbor was by Portuguese explorer Juan Rodriguez Cabrillo. On October 8, 1542, Cabrillo came across a marshland and natural harbor at the northwest end of San Pedro Bay and named the area Bahia de Los Fumas or “Bay of Smokes” after the smoke that rose from the nearby hillside of Native American hunters. This fairly desolate area remained largely intact until 1769, when Spanish officials and missionaries set their sights on colonizing the U.S. West Coast. This led to the first commercial ventures in San Pedro in the mid-1800s. The rest, as they say, is history. The harbor in San Pedro was used as a trading post by Spanish missionary monks from Mission San Gabriel Arcángel. The monks met ships at the water's edge with provisions from Spain. The first American trading ship to call at San Pedro was the Lelia Bryd, in 1805. At that time, it was illegal to conduct business with any other country but Spain. Because of the distance and loose regulations, however, trade with other countries thrived. In 1822 an independent Mexican government lifted the Spanish restrictions on trade. That led to a surge of settlement and commercial ventures in San Pedro. By the time California joined in the Union, in 1848, business in San Pedro harbor was flourishing. A host of politicians, businessmen and community visionaries are responsible for San Pedro Bay fulfilling its ultimate destiny of becoming the largest cargo gateway into North America. One such visionary was Phineas Banning, who founded Wilmington and was nicknamed the Father of Los Angeles Harbor. His entrepreneurialism and influence positioned the Port for future success as the maritime and trade center for a rapidly growing west coast city. Another person to play an important role in the development of San Pedro Bay was Stephen M. White, also called the Savior of the Bay. White, a senator from California, stood up to big business and political forces, pushing through regulation that led Congress to declare San Pedro Bay as the official port for Los Angeles in 1897. The City of Los Angeles and the Harbor Area experienced unparalleled population growth in the early 20th century. City leaders recognized the Port's growth opportunities and created the Board of Harbor Commissioners on December 9, 1907, thus marking the official founding of the Port of Los Angeles. The cities of San Pedro and Wilmington were annexed to the City of Los Angeles on August 28, 1909, making the Port of Los Angeles an official department of the City of Los Angeles. 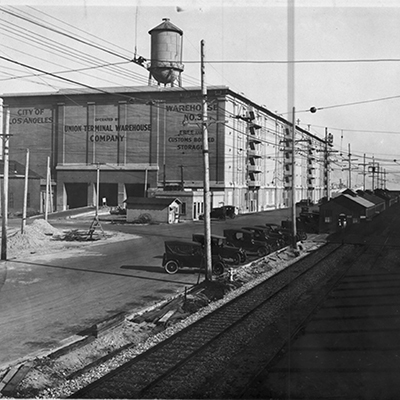 Various industries began popping up in and around the Port in the early 1900s. Fishing, canneries, oil drilling and shipbuilding were major industries that generated jobs and commerce to Los Angeles and its growing population. Because of increased business activities at the Port, it was extremely important for city officials to focus on port infrastructure and future development. By 1912, dredging and widening the main channel, and completing major sections of the federal breakwater, enabled the Port to accommodate larger vessels. These expansions proved effective once the Panama Canal opened in 1914, giving the Port of Los Angeles a unique strategic position for international trade and a clear advantage over northern West Coast ports as a destination point for east-to-west seaborne trade because of its proximity to the Panama Canal. The Port's growth came to a standstill with the onset of World War II. The United States military commissioned the Port to conduct only war-time efforts, and the Port did so with diligence and success. Shipbuilding became the prime economic industry at the Port. Every boat repair and shipbuilding company assisted in the construction, conversion and repair of vessels for the war effort. San Pedro Bay shipyards collectively employed more than 90,000 workers and produced thousands of war-time vessels at record pace. After the victory of World War II, Port of Los Angeles officials again began focusing their attention to the continued expansion and development of the Port. 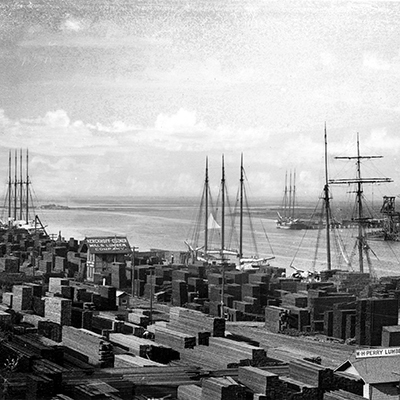 Up until the mid-20th century, the Port received cargo in crates, pallets, and small lots of varying sizes and shapes. Because of the lack of uniformity and security, unloading cargo was painstakingly slow and the frequency of damage, pilferage and loss of cargo was high. Providing a better solution, the containerized cargo revolution came to the Port in the late 1950s. Containers can easily be loaded, sealed and shipped on vessels, railroad cars, and trucks. Almost every manufactured product or its components are shipped in a container. Containerization is an important element of the innovations in logistics and security that propelled the Port of Los Angeles to critical national importance. The Port of Los Angeles is the number one port by container volume and cargo value in the United States, an annual ranking held consecutively since the year 2000. As the leading gateway for trade between the U.S. and Asia, the Port and supply chain partners provide outstanding cargo conveyance through modernized and “big ship active” marine terminal facilities; the largest workforce of skilled longshore labor; warehouse and trans-loading centers to meet the needs of every shipper; the nation’s largest and newest drayage fleet; and rail connections that offer frequency and speed-to-market access to major freight hubs across the U.S.
Maritime Minute is a video series for web and social media that features 60-second historical vignettes about the Port of Los Angeles, hosted and narrated by Marifrances Trivelli, Director of the Los Angeles Maritime Museum. Each Maritime Minute episode features old, rarely seen photos from both the Port’s and Museum’s collections and uncovers little-known facts about the Port of Los Angeles, from its role during World War II to big businesses that started in Los Angeles Harbor—all in just one minute. The Port of Los Angeles celebrated its Centennial on December 9, 2007. As part of the Port of Los Angeles Centennial Oral History Project, these videos feature various members of the Los Angeles Harbor Area community who were interviewed in 2007 to document different eras in Port history.